Maybe a chance for Babushka Lady´s Face in a Bronson Foto ???? Re: Maybe a chance for Babushka Lady´s Face in a Bronson Foto ???? Hello again to all and thanks for your posts. Excuse me, that I'm writing now, was very busy in the last few days. I will always look at photos from the day of the assassination. Maybe I'll find more shots with the Babushka Lady or people who might match their identity. Have always looked at various pictures and movies, but with very disappointing result. As for the person in the Bronson photo, someone came to me on the Patsy Paschall film, which could be the same person. Whether this is the Babushka Lady is more than uncertain, so it is hardly worth keeping track. 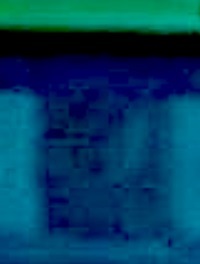 In addition, it seems as if the Skaggs photo someone in the inside of the vehicle is reflected in front of the Allen-Skaggs-Babushka Lady stands (on the windscreen, except perhaps the sky does not reflect anything, so the reflected object must be in or behind the vehicle are located). The Skaggs photo gave me the idea that the Babushka Lady might have reflected on one of the passing vehicles like the presidential limousine in the Muchmore movie or another vehicle in the Bell movie and Allen-Foto (for the Allen-Skaggs-Babushka at least). Unfortunately I could not recognize anything yet. The problem with the reflection is that the Babushka lady, if it is too far away from the vehicle, would most likely only reflect on the body of the vehicles, as the car windows are more likely to reflect upwards. This reflection on the body would shrink the babushka lady very much, so that you need a very good image editing program to maybe make something visible (in addition, you get in danger of pareidolia to expire ). Nevertheless, I will continue to try to find something. Wish you all a nice and happy New Year and much success and new insights in your research. Your posted still frame is a view Down Main St = your alleged Babushka Lady having to conquer a Time & Distance Issue in order for her to arrive at her Elm St position ahead of the JFK Limo as captured on the Zapruder Film. I do Not believe your alleged Babushka Lady could have conquered this Time & Distance issue, nor have I ever heard or read of Anyone positioned down Main St having achieved this necessary mad dash on 11/22/63.. Yes, you are right. As Robin Unger wrote, there were some women wearing a coat and headscarf that day. Even if the person on the Paschal film is the same as on the Bronson photo, I think it's impossible that this is the Babushka lady. The place-time aspect I stupidly ignored. With a little luck, perhaps the reflection idea brings something more to light. However, this idea is very problematic. 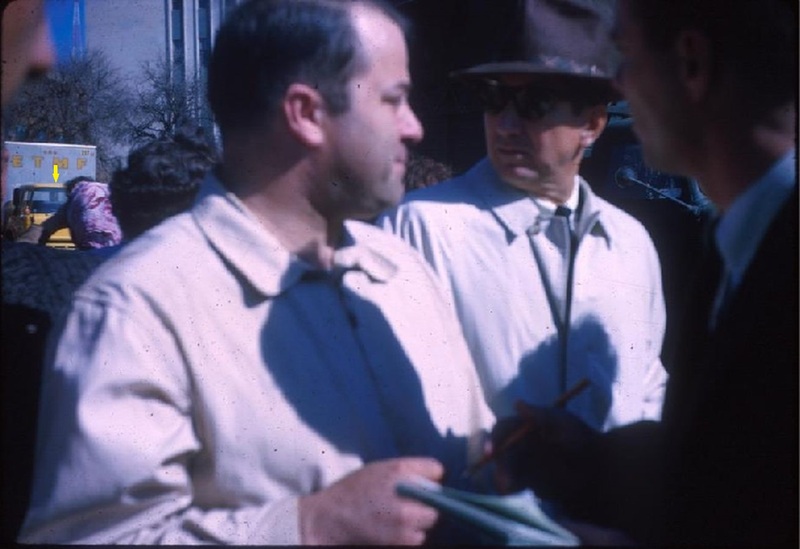 There are some difficult factors, such as the direction of the sunbeams, catching the right moment, persons covering the reflection (eg Muchmorefilm, Charles Brehm stands next to Babushkalady), babushkalady's distance to cars, the fact that the reflection the body of a person shrinks back and the image quality itself. In addition, neither the knowledge to make reflections clearly visible or a good image editing program, which complicates the project. The brain also makes faces and people see where there are none (Pareidolia). Nevertheless, it is in my opinion worth it to continue to try with this idea. 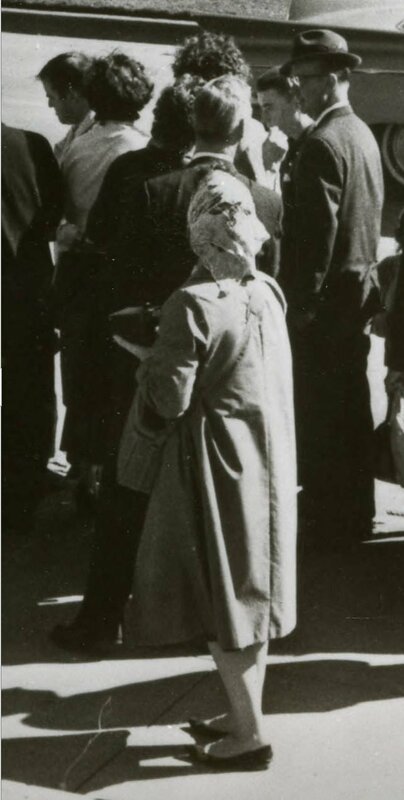 With the material you have so far about babushkalady it is almost impossible to identify her. 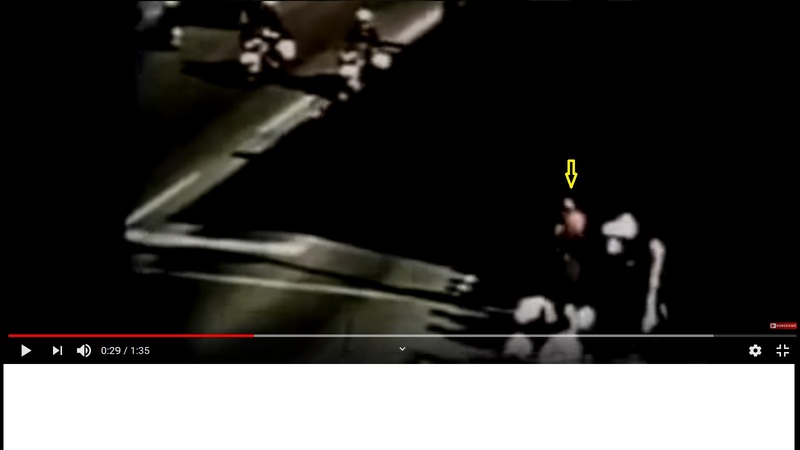 As you all know, she seems too blurred on the Zapruder video, Nix shows the lady too short, on the muchmorefilm you can only see her from behind, at the bellfilm also almost only from behind and if the side is her face too shady and bronson was too far away and she appeared from behind. The couch movie (and I think the movie Darnell too) have unfortunately a bit too bad quality for an identification. The best way to recognize something from her face was on one of the wilma-bond photos (maybe it was also a screenshot of the mark bell movie), in which I inverted the colors. Unfortunately even here, the face from the side and very gaudy can be seen here. Also good photos of Skaggs and Allen (most assume that it is the same babushkalady) help unfortunately hardly in the identification. Maybe someone will still find the decisive hints. Until then, I wish all of you a happy and successful new year again. in my last post, I announced that I would try to make a little more of the face of the Babushka Lady (based on reflections on passing cars). In particular, I watched the reflections in the films of Marie Muchmore and Mark Bell. So far I have not been able to discover anything that seemed relevant to me in the Muchmore movie. Even with the Bell movie, the discoveries are rather disappointing. , where I did not discover this reflection). I inserted the screenshot in OpenOffice and changed the brightness and contrast values ​​and tried to sharpen the image. Unfortunately, the result is anything but satisfactory. Interestingly, here the reflection took place on a car window pane and not on the body of the car. At the Bell Film, though, the babushka lady's reflections on the car window might be possible because she's pretty close to the street (at the muchmore movie, she's a bit further away from the cars, I think). Nevertheless, I can not say exactly whether the face of a person is really reflected on the windowpane or whether you see something that is in the car (the part of the reflection which in my opinion could be a face disappears after the car disappears on the babushka lady drives past, which suggests that maybe something from the outside on the car window has reflected). Anyway, maybe you have the necessary know-how and a good image processing program and can therefore get a bit more out of the reflections than my poor attempts here. I'm pretty sure that at least part of the Babushka Lady must have reflected on one of the passing vehicles. Maybe this will give you new insights. Until then, a lot of fun, luck and, above all, success in your further research.